A fairly close picture of SCP-144 taken from the neighboring mountain. The temple below is not visible through the mist. Special Containment Procedures: SCP-144 requires the presence of only one Foundation observer to monitor and issue updates on the condition of SCP-144. The Tibetan Buddhist monks who maintain the site live in solitude and secrecy. 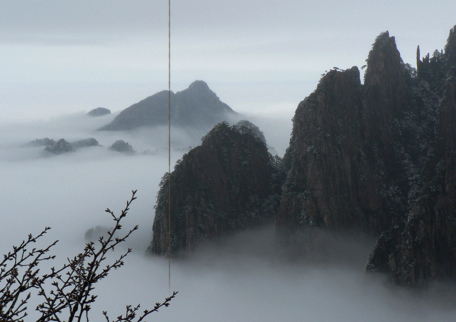 A heavy mist condenses around the small mountain that hosts SCP-144, which itself resides in a small valley between two greater mountains, Mount [DATA EXPUNGED] and [DATA EXPUNGED]. This mist is present most of the year and the thin rope itself is only fairly visible to the human eye within a distance of 3 km. Air travel within a 70 km radius has been restricted with the cooperation of the Chinese government. Description: Located in a monastery atop a small Tibetan mountain, SCP-144 is a thin, taut hempen rope, only 1.2 cm thick, attached to a ring of jade bound to the floor of an atrium in the temple (known as "Base Camp" amongst researchers). The other end of SCP-144 extends straight upward many kilometers up into the sky to a yet-to-be-explored satellite in geostationary orbit above the Earth at an altitude of about 39 km (over 22 miles away, known as "the Summit" amongst researchers). Several times a year, a monk of the temple ascends up the rope several hundred meters in a ritual of spiritual enlightenment. The monks report that to this day, only one person by the name of [DATA EXPUNGED] has ever been killed during the ascension. Throughout the centuries, several climbers have disappeared, yet the monks believe that one day they will return, bringing greater understanding and enlightenment with them. Carbon dating of rope fibers put SCP-144 at just over 1400 years old. Foundation anthropologists believe that the rope and the tradition of climbing it began within the rituals of an ancient, dead religion before Emperor Songtsän Gampo brought Buddhism to Tibet. At that time, it is believed that the rope was several kilometers longer. The attendant monks say that the jade ring was added in the early 9th century by the Ralpacan to keep seasonal winds from picking up the rope and swinging it throughout the country side. Several times a year, the head monks untie the rope from the loop of jade and reposition the knot. Research has shown that in recent years, the rope has moved skyward at a rate of about 180 cm per year and is slightly accelerating at a rate of a hundredth of a centimeter/year². With only a few hundred meters of rope left, the monks are unsure of what do to when it reaches the end. Some hope to add length by attaching separate sections of rope to the original, while others believe that new rope won't have the strength of the old. Research has been unable to explain how plant fiber rope has been able to survive 1400 years and maintain such tensile strength at such extreme temperatures and conditions of the upper atmosphere and space that people are able to climb it, let alone support its own enormous weight against itself (all 39 km worth of rope). If the Summit is accelerating away from earth, its pull on SCP-144 is also unexplained. The Summit has only been properly imaged by ground-based telescopes, which show the rope of SCP-144 going up and over the edge of a large asteroid-like rock, several hundred meters in width. Satellites have been unable to picture the opposite ("Dark") side of the Summit. It has been reasoned that orbiting satellites are designed to image ground-based locations or distant space objects at much greater distances than other neighboring orbital satellites. Researchers disagree about why images of the dark side of the Summit return blurry and unfocused, rendering the dark side unknown. Addendum #144-4: Several Class D personnel were offered immediate release if they were to climb to the summit, if possible, and return. While multiple warnings were issued by the monks attending the rope, no resistance was offered. Of the 6 personnel who accepted, 4 returned to Base Camp complaining of difficulty breathing and lack of air, 1 slammed into Base Camp at terminal velocity, presumably after losing his grip from fatigue, and the last has not yet returned.